Letters from Backstage: Mira Taichman – Front Row Theatre Co.
We are so excited to be working on our fall show, The Shadow Box! To celebrate, we’re kicking off a new series of posts to give you a sneak peek into our weird and wonderful world of theatre. Today we hear from Mira Taichman, our illustrious director! Mira in Quadramics’ 2014 production of HAIR. 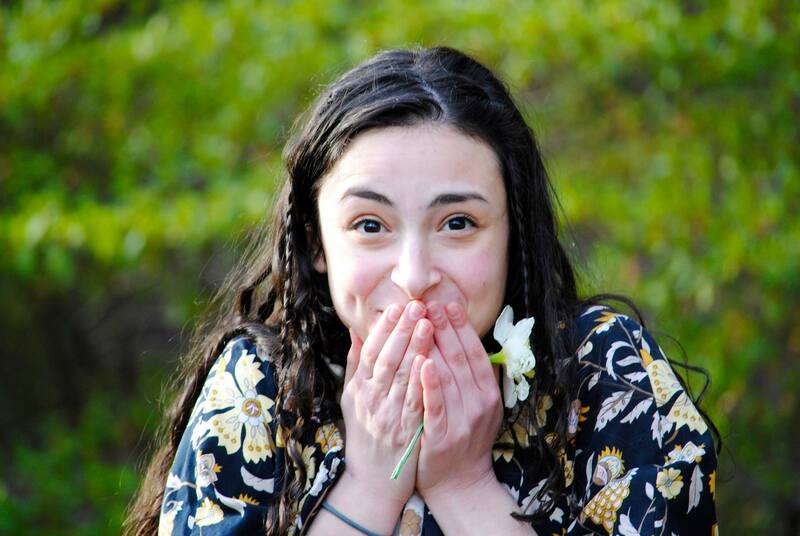 My name is Mira Taichman, and I’m the lucky kid with the incredible opportunity to direct Front Row Theatre Company’s fall production of The Shadow Box. This show follows three families as they deal with diagnoses of terminal cancer. But this is not a play about dying. The way I see it, this is a play about learning to take care of ourselves and the people we love. How do you show love and support for someone in a crisis? How do you forgive yourself for not knowing how? The Shadow Box exposes that nobody knows what to do in the face of adversity, and it is okay to mess up along the way. At a high-pressure school like Penn, where everyone needs to look like they’ve got everything all figured out, this play is a comforting reminder that sometimes we blunder through life— we destroy relationships we care about, we miss out on opportunities, we have regrets, we make mistakes—and that is okay. The Shadow Box helps us accept ourselves, flaws and all, and to realize that every life—no matter how imperfect it may be—is worth the struggle. 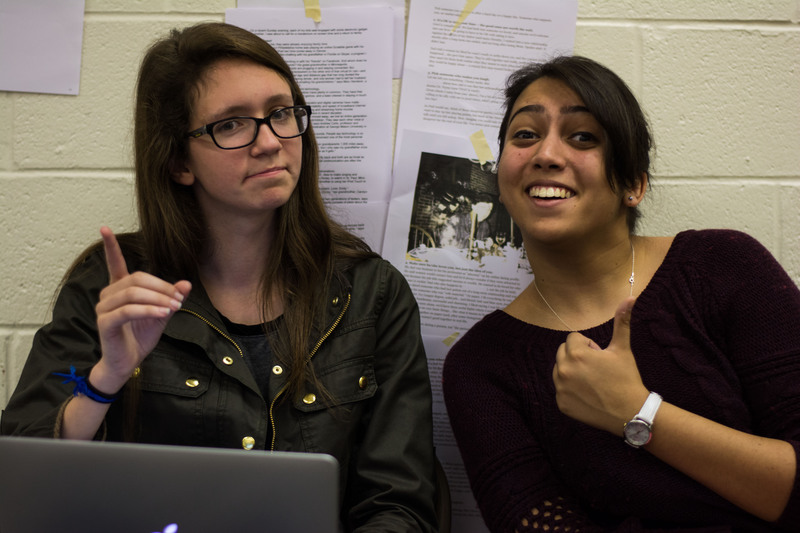 Stage Manager Julianna (left) and Assistant Stage Manager Shailly (right). Needless to say, I fell in love with this play the first time I read it last spring, and I am more and more excited by it with every rehearsal. As director, I get to pull together all the pieces of the play—the acting, the lights, the set, the music, the costumes—under one creative vision. The best part about this job is that I get to work with each actor, designer, and board member and watch all of their creative processes. We have such a talented team of people working on this production, and I get to be there for every step of the way. One of my favorite parts of directing is learning how each individual actor works—for instance, an exercise that helps one actor connect with his or her character might not work at all for somebody else, so I need to come up with different ways of helping each performer do his or her best. This means that I get to know each actor on a very personal level, and I am so lucky to have that opportunity. 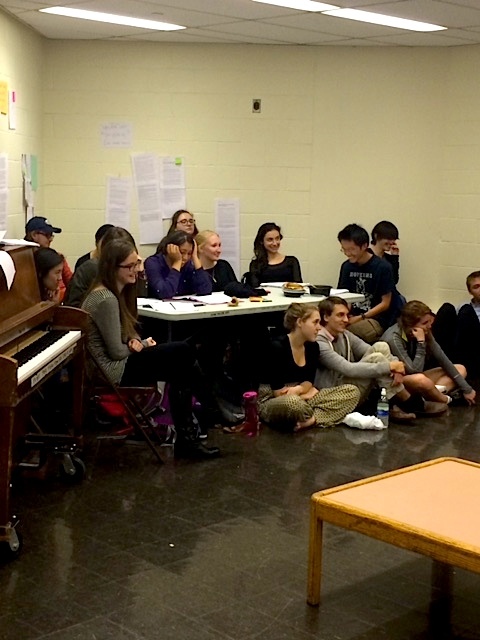 The actors are crazy talented and hardworking, and they make this process so rewarding for me. Also, huge shout out to the goddess who sits next to me in every rehearsal, our lovely stage manager Julianna. That girl saves my life on a daily basis and I don’t know what I’d do without her. I am so excited to watch the production continue coming together as we approach tech week! Can’t wait to see you all on opening night!